The Jacksonville Jaguars failed to give Bortles enough time or protection in a 30-14 loss at the Chiefs on Sunday. Bortles was sacked five times, fumbling once, and hurried way more often. 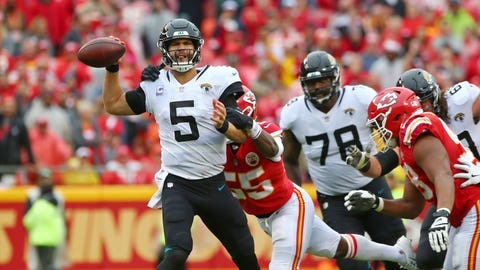 JACKSONVILLE, Fla. (AP) — Blake Bortles was largely ineffective despite a career-high 430 yards passing against Kansas City. His offensive line was the biggest problem. According to Pro Football Focus, Jacksonville’s line allowed 24 total quarterback pressures — seven more than any other NFL team in Week 5. “We take an immense amount of pride in our work,” backup left tackle Josh Walker said Monday. “That’s going to be the goal of our group this week: to be more determined to be better and do a better job in protecting Blake. We’ve got to keep him clean. That’s our job and that’s what we’re going to do. The Jaguars (3-2) might have to make some roster changes to find help. Left tackle Josh Wells has a groin injury that could cause him to miss Sunday’s game at Dallas (2-3), and tight end Austin Seferian-Jenkins is headed to injured reserve and will have core muscle surgery. Coach Doug Marrone said Wells is “week to week” and Seferian-Jenkins is expected to return later in the year. Running back Corey Grant (foot) also is done for the season, joining Leonard Fournette on the sideline. Fournette is expected to miss his fourth game of the season because of a sprained right hamstring. The Jaguars are planning to sign a running back and likely will do the same at left tackle. The O-line was Jacksonville’s weak link last year, failing to create holes for Fournette in the second half of the season. The Jags thought signing All-Pro left guard Andrew Norwell to a five-year, $66.5 million contract in free agency would solidify the front. But Norwell has been average, at best, while playing alongside three different left tackles: Cam Robinson, Wells and Walker. Robinson is out for the season with a knee injury. The Jaguars essentially abandoned the running game after falling behind 20-0 late in the second quarter. That put a lot of pressure on Bortles and even more stress on the line, which really struggled against speedy linebacker Dee Ford. Bortles completed 33 of 61 passes, with one touchdown and four interceptions.